The hermetically closed design and the fully automated, uninterrupted operation of the HEINKEL Inverting Filter Centrifuges afford maximum protection against contamination for operating personnel, environment and product. 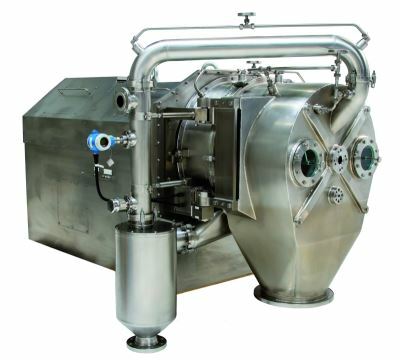 Through its gentle product discharge leaving no residual heel and the possibility of thin cake filtration, the HEINKEL Inverting Filter Centrifuge is ideally suited for use with difficult to filter products. The slurry (liquid stream containing solid to be separated) is delivered to the process chamber which is a rotating drum a feed pipe. The filling step is usually controlled through a load cell based weight control system that can optionally be controlled by time or volume. The wash liquid is introduced and controlled in the same manner as the slurry. Due to the homogeneous cake build-up, each part of the solid cake will be washed to the same quality. The drum spins at a pre-set value chosen from the speed range of the individual machine. The filtrate passes through the filter cloth which lines the process chamber during which the solids collect and build up on the filter cloth to form a cake of material. 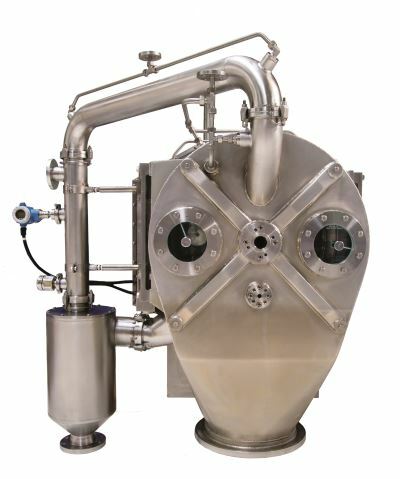 The modular PAC®-System can be delivered as a part of the original supply or as an add –on feature for the HEINKEL Inverting Filter Centrifuge to expand its area of application. The PAC®-System makes it possible to pressurize the process chamber inside the drum with a gas pressure of up to 6 bar. The HYPERCENTRIFUGATION® process produces lower residual moistures accelerating the dewatering of the solids and it increases product quantity and quality. Products which could not previously be separated using centrifuge technology can now be separated effortlessly through the HYPERCENTRIFUGATION® process. 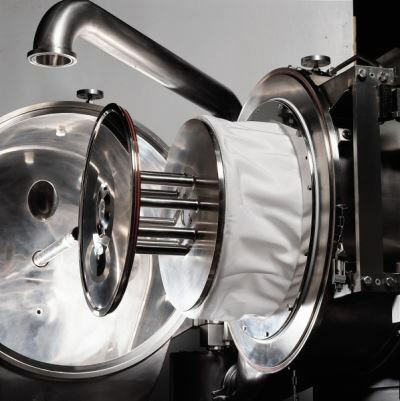 The separated solids are discharged by inverting the filter cloth through the axial movement of the shaft, during which the bowl keeps rotating at a low speed. Certifiable cleaning of the Inverting Filter Centrifuge HF is effectively carried out in a closed condition through fully automated CIP-cleaning systems. Product change-over is quickly and easily completed. To achieve the best possible cleaning inside the process housings of the centrifuge it is possible to fill the centrifuge with cleaning liquid. After a certain level is detected by a dedicated level switch the cleaning liquid flow is stopped.